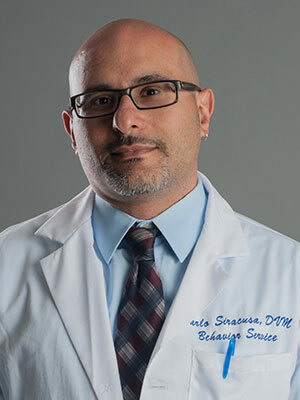 Born in Italy, Carlo Siracusa got his DVM from the University of Messina, Italy, and his PhD from the Autonomous University of Barcelona, Spain, defending a thesis on perioperative stress in dogs and the effect of pheromone therapy. He completed his residency in Animal Behavior at the School of Veterinary Medicine of the University of Pennsylvania, where he is currently the Director of the Animal Behavior Service. Carlo is board certified by the American College of Veterinary Behaviorists, and the European College of Animal Welfare and Behavior Medicine. His research interests are focused on stress evaluation in dogs; pheromone therapy; canine and feline temperament evaluation; prognostic factors and treatment outcome of behavior problems; cognitive changes in dogs with mucopolysaccharidosis. The welfare of household dogs and cats is not always perceived as a concern when compared to the welfare of production animals. However, household pets often experience poor welfare caused by the lack of adequate knowledge of their species-typical behavior. Among the “five freedoms” at the base of animal welfare, the freedom to express a species-typical behavior is essential to a good quality of life and welfare. Cats and dogs living in close contact with humans may experience severe challenges to this freedom. Moreover, the welfare of geriatric patients can be especially compromised since other essential freedoms may be difficult to achieve, i.e. freedom from discomfort, disease and pain. Sensory impairment, chronic pain, cognitive and memory decline may compromise the ability of a geriatric patient to perform normal behaviors. Nevertheless, an adequate amount of behavioral stimulation should be provided to ensure a good quality of life. Environmental enrichment should account for the decreased ability of the geriatric patient to reach for, handle and chew on toys; the ability to obtain food from food-enhanced toys; and the accessibility and comfort of resting places and safe spots. Special training protocols should be implemented, with the ultimate goal to increase environmental predictability and improve communication. Training exercises should be brief and simple, and should be targeted to the specific skills of the subject. For example, a “sit” cue should be avoided in dogs with chronic pain of the lower back, hips or knees, and a “watch me” cue may be used the get the dog’s attention. Conversely, if the vision is impaired a “touch” cue may be preferred to a “watch me” cue. It is also important to keep in mind that the learning skills and memory of the animal may be impaired, therefore frequent repetition of the exercise is beneficial. Training and environmental enrichment for geriatric patients will be reviewed during the lecture.